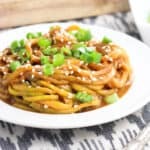 Sesame almond butter zucchini noodles are a hearty and healthy main dish recipe, making use of a spiralizer. This vegetarian main dish recipe is thick, creamy, and coats the ‘zoodles’ beautifully. 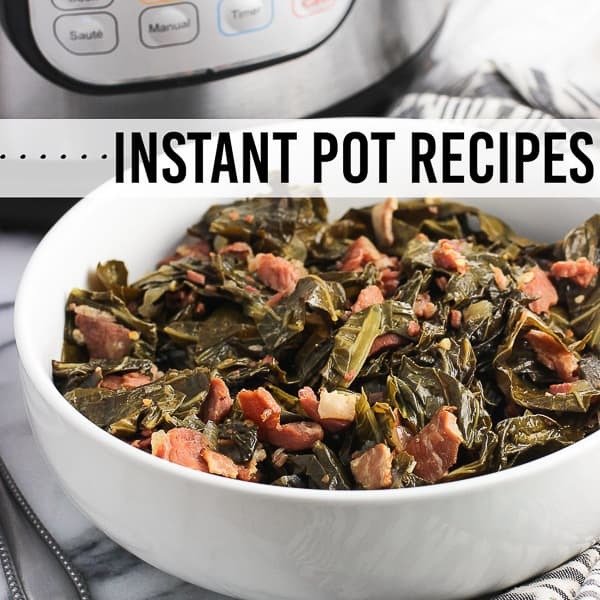 It’s a 20-minute meal that’s adaptable to what you have on hand! 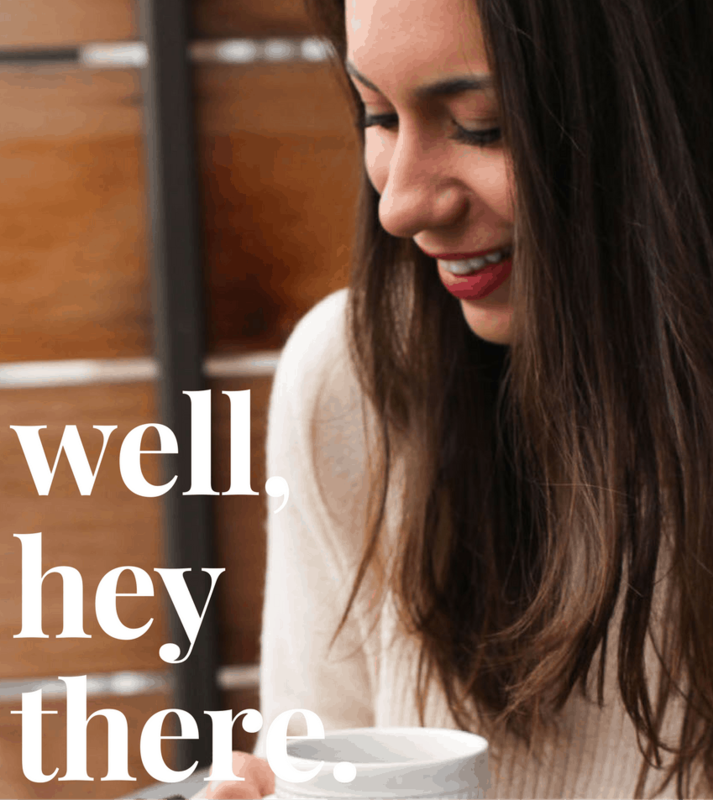 I’m sorry (okay, not sorry) for all of the spiralizing I foresee gracing the blog in the coming months. Truth is, I got a spiralizer! Pretty sure the fruits and veggies hanging out in my fridge are shaking in their proverbial boots right now. And when it came to this sesame almond butter zucchini noodles, the zucchini hogging up my produce drawer took the fall. Each time I spiralize something I’m kind of amazed at how good it is. Generally I’m not picky when it comes to vegetables buuuuut I will say I don’t exactly lose sleep over missing out on the traditional zucchini side dishes when presented with them out at dinner. This spiralizing business though…never have I ever downed multiple zucchini in a day and wished I had more. Until now! That. Blows. My. Mind. 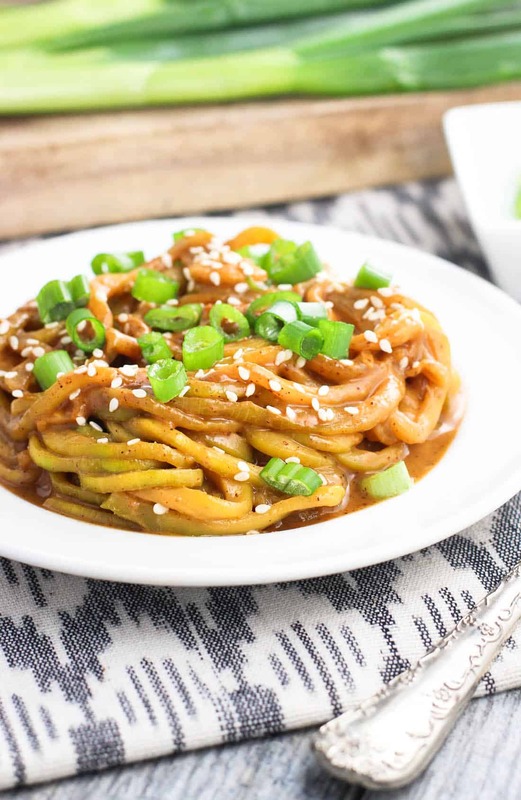 One of the first meals I broke out my spiralizer for were these sesame almond butter zucchini noodles. An easy-to-make sesame almond butter sauce is poured over stir-fried zucchini noodles and mixed until the “zoodles” are evenly coated. This healthy meal takes about 20 minutes from start to finish, which totally makes it weeknight-friendly. Yessss! 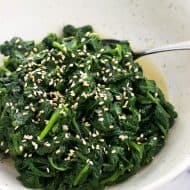 This sauce (in loose form) is one of my favorite things to whip up when I’m feeling like an Asian-inspired dinner, or to be honest if I have NO idea what to make. Most of the time I have all of the ingredients on hand, but I’ve done plenty of substitutions. I’ve used peanut butter in place of almond butter, chili garlic sauce for the sriracha, subbed in some rice vinegar if I didn’t have enough soy sauce, etc. You can really adapt this sauce recipe and make it yours. 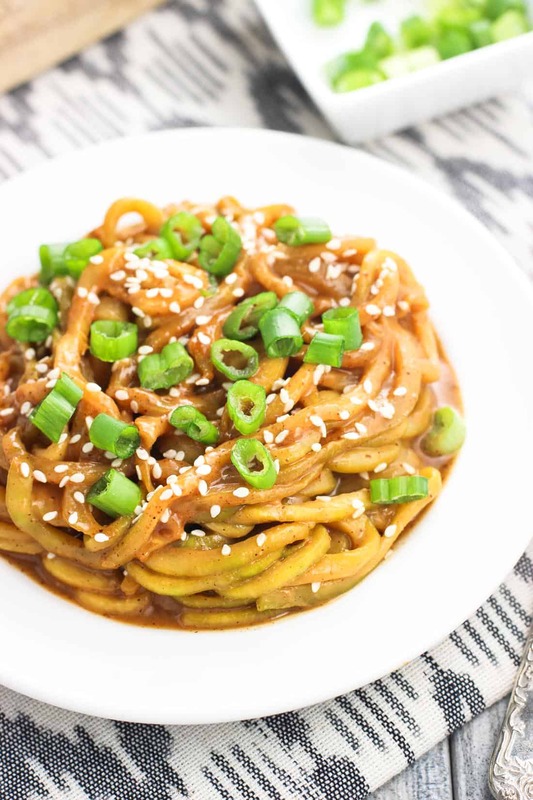 Besides the magic of getting me to down a bushel of zucchini, these sesame almond butter zucchini noodles have a knack for filling me up for hours afterwards. That may sound silly because this meal is comprised of zucchini, a food that’s super low in calories and not exactly thought of as ‘filling’. This sesame almond butter sauce adds a heartiness and a good deal of heft by coating these zucchini noodles to make it more substantial. Plus serve these zucchini noodles hot or serve them cold straight from the fridge – they’re great either way! I have a small apartment kitchen so I resisted getting a spiralizer for a while because cabinet space is at a premium around here. I have a KitchenAid stand mixer, so this KitchenAid spiralizer attachment is ♥. I expected there to be a learning curve when it came to getting uniform, long spaghetti-like noodles, but for real, once I snapped the blades into place and flipped the switch on, a zucchini was ‘zoodled’ in less than 20 seconds. If there’s anything to point out (besides it not taking up much room! ), vegetables longer than about 7” may need to be cut in half in order to fit in the attachment, but I don’t think that’s anything particular about my model. But even so, an extra few seconds is no biggie, especially when it comes to quick meals like this one, right? 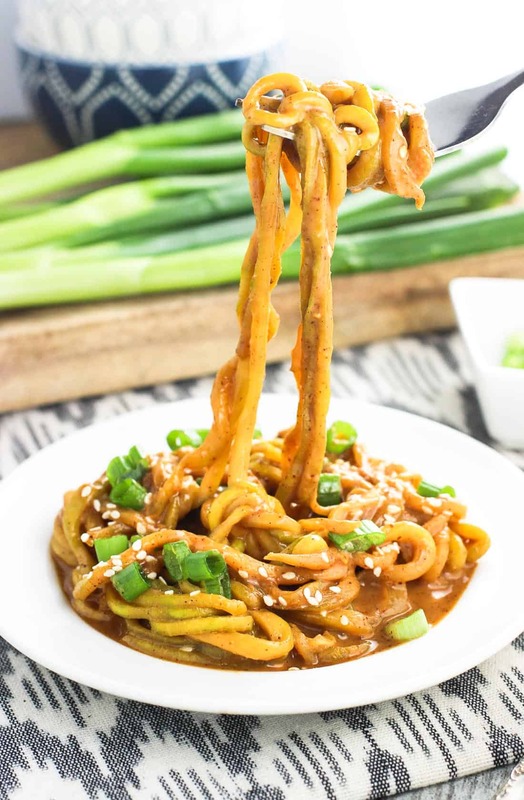 Come geek out with me over spiralizer recipes and follow along with my Spiralizer Recipes board over on Pinterest! 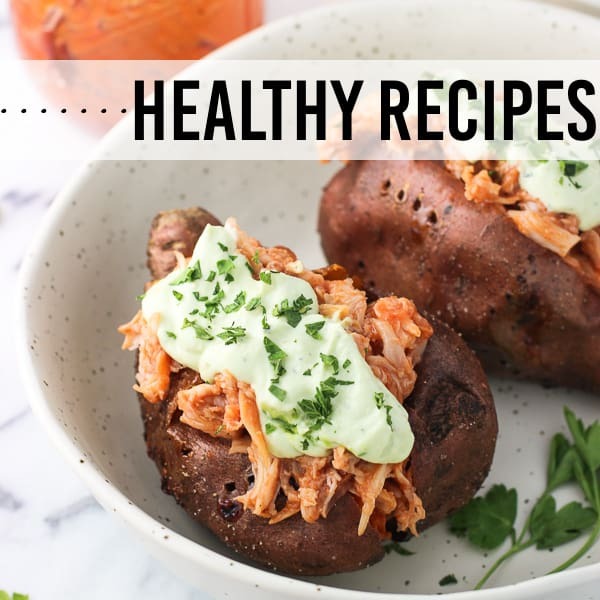 See how easy this recipe is to make below! Spiralize zucchini and set aside. I peeled them first, but you don't have to. In a bowl, whisk together all all sauce ingredients and set aside. Add olive oil to a large non-stick skillet set over medium heat. Add zucchini noodles and let cook for about 4-6 minutes, stirring frequently to allow all of the zucchini noodles to become tender. Add additional olive oil as needed. Once noodles have softened and are tender (like cooked spaghetti), remove skillet from heat and pour in sauce. You may wish to pour out any excess water released from the zucchini as it cooked from the skillet before continuing so the sauce doesn't thin too much. Stir to evenly coat the noodles with the sauce. Serve with a garnish of sesame seeds and/or sliced scallions. The zucchini noodles will reduce in size as they cook. 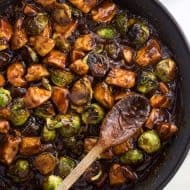 You'll want to use a large skillet to accommodate all of the zucchini, however if there's too much zucchini for your pan, you can stir fry them in two batches, adding a proportionate amount of sauce to the size of each batch. Because zucchini tend to vary in size, pour in enough sauce to generously coat the quantity of zucchini noodles you have. The five-spice powder adds a unique flavor to this sauce, but can be omitted if you don't have it. If using, I'd suggest starting with 1/8 tsp and seeing if the flavor is right for you before adding up to an additional 1/8 tsp. Hi! Any idea on nutritional side of things… cal, carbs, sodium? Looks amazing! Appreciate any shared knowledge! Hi! This was amazing! Thank you for sharing. I customized it a little. Instead of siracha, I used red chili paste. Also, I made a second batch of the sauce without the almond butter and I sautéed water chestnuts and stir fry beef in it. I strained it and then I put this on top of your recipe. It was incredible! What is 5-spice powder and can I make it myself? Hi Lynda, 5-spice powder is an Asian spice blend that’s usually a combination of pepper, cinnamon, cloves, and more. It adds a pretty unique flavor! I’ve seen it in major grocery stores and have come across recipes for making it yourself, like this one (though there are more out there): http://cooking.nytimes.com/recipes/10605-five-spice-powder . That said you can definitely omit it if you don’t have some of those spices on hand. I hope that helps! So delicious! I will be making this again and again! What would you recommend in place of the soy sauce? I’m on a cleanse and soy sauce isn’t approved. Hi Amanda! I went through a period where I cut out soy and really enjoyed coconut aminos (by the Coconut Secret brand). You can find it on Amazon, but I’ve also found it in some grocery stores. It has absolutely no soy, and I believe it’s even Whole 30 compliant. Of course I’m not sure the specifics of your cleanse, but it’s the “cleanest” soy alternative I’ve found. 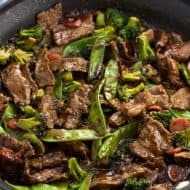 It doesn’t taste exactly like soy sauce, but for recipes like this where it’s in a sauce, I think it would work great. That said I even liked it by itself. Good luck! This looks so good! I’d like to make this as a side dish. Any ideas of what it would go well with to make for the main entree? Thanks Michelle! My first choice would be salmon with an Asian-style marinade/sauce. Keeping it healthy with compatible flavors! Thanks for the suggestion. I will have to try that. But tonight I am making it for some people who do not like fish so I went with pineapple chicken skewers with a peanut sauce. Very tasty! Yum! Pineapple chicken skewers sound delicious. I added peanuts on top! Very yummy! Awesome! So glad you enjoyed, Shelly! 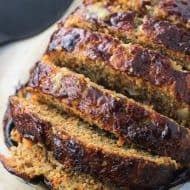 I just HAD to pin this recipe because it looks WAY too irresistible! And I totally don’t think it’s a shame to spiralize everything, haha! Hey thanks Cassie! 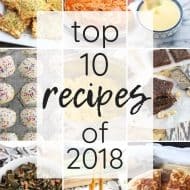 And I so agree – I definitely am putting my spiralizer to good use!! This looks incredible, but I tend to have an issue with the zucchini giving off too much water. 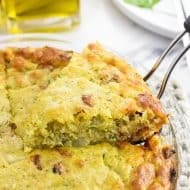 Do you find that with this recipe? If so, how do you keep it from thining out your sauce? Hi, found you from Paleo Parents. I recently sold my spiralizer but I do plan on buying another that is not so bulky. Anyway, I was a little surprised to see you stir frying with olive oil…I think that using olive oil to cook with is a no no. Have you tried coconut oil instead? I think it would lend a very interesting and complementary note to this dish. Hi Beth, thanks for stopping by! I have seen discussions on smoke point and cooking fats. I used medium heat to cook these ‘zoodles’ and made sure the olive oil was never smoking. That said, you can for sure substitute in whatever cooking fat you prefer. I’ve gotten more and more into baking and cooking with coconut oil recently and am turning into quite a fan. The flavor would definitely work here! You’ve inspired me to bust out my spiralizer! I really need to use it more. 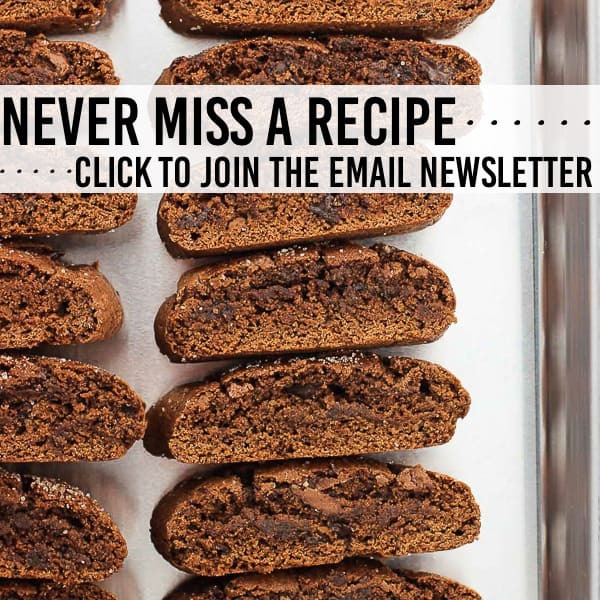 Keep the spiralizer recipes coming! This looks so dang gorgeous. And that sauce sounds DELISH! I love my spiralizer, and I prefer veggie noodles to real pasta! This meal looks delicious — I love these Asian flavors, and almond butter is a favorite! Yay for spiralizers! I used mine seriously so much that it actually broke a few months ago! LOL. I need to get a new one asap because honestly, these zoodles look absolutely amazing!! That sauce is perfect! I could eat food like this every day! Thanks Rebecca!